Boil and fry your favorite seafood or fresh vegetables to make a delightful meal. This 10.5 quart Aluminum Pot Set is perfect for all of your boiling, frying, and steaming needs. From French fries, and chicken wings to corn on the cob, this set is a necessity for any complete indoor or outdoor kitchen. Set includes 10.5qt pot and handled basket. 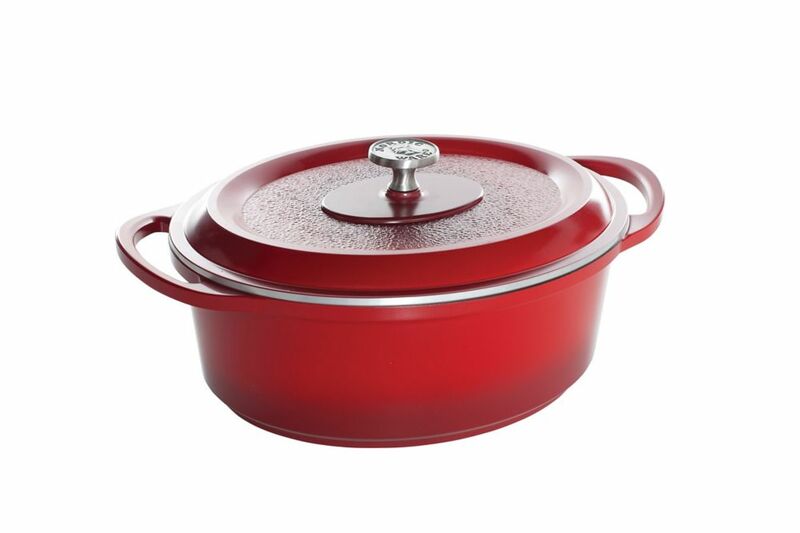 5.5 quart Oval Casserole Appreciably lighter weight than enamelled cast iron and with significantly more efficient cooking properties, Nordicware's latest innovation in cast aluminum bring unmatched performance to homes and kitchens. Designed with consumer input, the collection represents a true American value. Heirloom quality and lifetime warranty ensure this cookware and ovenware will become part of the family traditions for years to come! Features; integrated handles: one piece design ensures safe handling and durability. Fused Non-Stick interior: stain-resistant interior allows food to brown and sear evenly and makes clean up easy.